PHILIPPINES. SAN Fernando Bishop Artemio Rillera, a missionary from the Society of the Divine Word (SVD), died unexpectedly Sunday. He was 69. Rillera succumbed to severe asthma attack after holding a Mass at the Seminary of the Sacred Heart in San Fernando City, La Union. The prelate was immediately rushed to Bethany Hospital, also in the city, but he was pronounced dead on arrival at around 10:40 am. The Catholic Bishops’ Conference of the Philippines has expressed sorrow at the death of Rillera who had been an active member of the CBCP for 18 years. An official of the CBCP said the prelates are deeply saddened to hear Rillera’s death. “This came as a big shock. 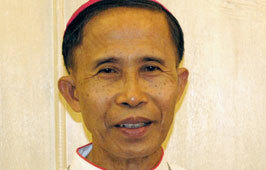 This was totally unexpected,” said Monsignor Pedro Quitorio, CBCP media director. Rillera was a known advocate against illegal drugs in La Union and led several street demonstrations for the authorities to act against it. Last February, the prelate led people to the streets in protest over a court order allowing one of the suspects in the operation of a drug laboratory in Naguilian, La Union in 2008 to post a P1 million bail. The bishop questioned why the Municipal Trial Court in Bauang, La Union allowed former Dagupan City chief of Police Dionicio Borromeo to file a bail bond for his temporary liberty.